Not to be confused with Old Malden or New Malden. Maldon ( /ˈmɔːldən/, locally /ˈmɒldən/) is a town on the Blackwater estuary in Essex, England. It is the seat of the Maldon District and starting point of the Chelmer and Blackwater Navigation. It is most renowned for Maldon Sea Salt which is produced in the area. The place-name Maldon is first attested in 913 in the Anglo-Saxon Chronicle, where it appears as Maeldun. Maldon's name comes from Mael meaning 'monument or cross' and dun meaning 'hill', so translates as 'monument on the hill'. East Saxons settled the area in the 5th century and the area to the south is still known as the Dengie Peninsula after the Dæningas. It became a significant Saxon port with a hythe or quayside and artisan quarters. Evidence of imported pottery from this period has been found in archaeological digs. From 958 there was a royal mint issuing coins for the late Anglo-Saxon and early Norman kings. It was one of the only two towns in Essex (Colchester was the other), and King Edward the Elder is thought to have lived here while combating the Danish settlers who had overrun North Essex and parts of East Anglia. A Viking raid was beaten off in 924, but in another raid in 991 the defenders were defeated in the Battle of Maldon and the Vikings received tribute but apparently did not attempt to sack the town. It became the subject of the celebrated Old English poem The Battle of Maldon. The battle is commemorated by a window in St Mary's Church and by a statue on the quayside of the slain Saxon warrior Byrhtnoth. According to the Domesday Book there were 54 households and an estimated 180 townsmen in 1086. The town still had the mint and supplied a warhorse and warship for the king's service in return for its privileges of self-government. The town was awarded a charter by Henry II in 1171, stating the rights of the town as well as defining its borders and detailing its duty to provide a ship for the monarch "when necessary". The town's All Saints' Church, unique in England in having a triangular tower, dates from around this period. While the precise building date is unknown, the church existed by 1180, the date of the foundation of nearby Beeleigh Abbey. A Charter of Richard I of December 1189 confirms "certain grants to Beeleigh Abbey, including the Church of Blessed Peter in Maldon and the Church of All Saints' in the same town". St Mary's Church, on the Hythe Quay has a grade 1 listed Norman nave from 1130, though evidence exists of an earlier church on the site from at least a hundred years before. In the 17th century Thomas Plume started the Plume Library to house over 8,000 books and pamphlets printed between 1487 and his death in 1704; the collection has been added to at various times since 1704. The Plume Library is to be found at St Peter's Church. Only the original tower survives, the rest of the building having been rebuilt by Thomas Plume to house his library (on the first floor) and what was Maldon Grammar School (on the ground floor). Maldon was chosen as one of the landing sites of a planned French invasion of Britain in 1744. However, the French invasion fleet was wrecked in storms, and their forces never landed. In the church of All Saints is a memorial window to George Washington, whose great-great grandfather, Lawrence Washington, is buried here. Unveiled by an American diplomat on 5 July 1928, the window displays Saint Nicholas with the Mayflower, Saint George and Saint Joan of Arc in the centre. At the top are the arms of the Washington family, and the arms of the USA, England, Scotland and Wales. At the bottom are depictions of George Washington, the landing of the Mayflower, the signing of the Declaration of Independence and the Statue of Liberty. Maldon railway station in 1851. Maldon's first railway link was a branch line to Witham opened in 1846. Later a second line linked Maldon with Woodham Ferrers on the Crouch Valley Line between Southminster and Wickford line. Whilst Wickford is itself on the line between Shenfield and Southend (thus providing Maldon with another route into London Liverpool Street), a short-lived spur line at Wickford also gave direct access towards Southend. Edward Arthur Fitch, writing in about 1895, states that from London's Liverpool Street station to Maldon East station via Witham there were eight trains on weekdays and three on Sundays and that via Wickford there were five trains on weekdays and none on Sundays. The fastest train took 85 minutes via Witham and 82 minutes via Wickford. Maldon's Hythe Quay is resident to a number of Thames Sailing Barges, these are among the last cargo vessels in the world still operating under sail, albeit now used in the spheres of education and leisure. Some ten to fifteen of the surviving fleet count Maldon as their home port, and many others are regular visitors alongside at the Quay. An annual sailing barge race ends with a parade of sail and prize-giving at the quay. Cooks yard, where barges were once built, is still working at the end of Maldon Quay. The town holds an annual "Taxi Day" which sees mentally and physically disabled children from London driven to Maldon in London Black Cabs for a fun day of activities and a meal. The event dates back to 1952 when a London cab driver visited the Elizabeth Fry Special School (formerly Grange Road Special School) in Plaistow. He wanted to do something special for the young patients he saw there. He wrote to every one of Essex's seaside towns to arrange an outing and the only town that was willing to help was Maldon, thus Taxi Day has remained a tradition ever since. The town holds the charitable Maldon mud race where competitors race across the Blackwater estuary at low tide, along the bank and back through the water. The race generated over £55,000 for charities in 2014. Maldon also hosts the international Maldon Festival, which takes place each year in late June and July. Maldon and the surrounding area are the setting for a series of books by the prolific author, S. L. Bensusan. Bensusan's stories recall a lost way of life among the towns and villages in the area, and along the local coastline and marshland. In Bensusan's books, Maldon is called Market Waldron. Maldon has been the setting for numerous television productions, including Lawless Heart (2001) starring Bill Nighy, and BBC1's The Murder Game (2003) where numerous Blackwater Estuary locations were used including Green's Flour Mill at the bottom of Market Hill and Steeple Marshes. One episode of the TV series Lovejoy featuring Ian McShane was also filmed there. In H. G. Wells' The War of the Worlds (1898); Maldon is the town from which the narrator's brother and two female companions manage to escape across the channel. Maldon also features in the Marvel Comics Universe, the twin superheroes Psylocke and Captain Britain were born and brought up in Maldon. Maldon has a Non-League football club Maldon & Tiptree F.C. who play at the Wallace Binder Ground. There are many developed youth football teams in Maldon, among them being Maldon Saints. The town has a vibrant cricket club, with several adult and colts' sides, who play at two grounds: The Promenade Park, Maldon and the main ground at Drapers Farm, Heybridge. Recent improvements to the ground include a dual-lane enclosed all-weather net facility. Overseas players from Australia, South Africa and Sri Lanka have coached cricket in local primary schools as part of the "ECB Chance To Shine" programme. Drapers Farm is also the home of Maldon Rugby Union Football Club which was founded in 1947 by Tommy Harries, who was the landlord of the King's Head public house in Maldon High Street. The inaugural meeting was on 28 August 1947 at the Blue Boar Hotel. Maldon RFC run several senior male sides and one female side as well as all youth age groups from under 7s to under 18s. Maldon Sea Salt has been produced in the town since 1882 by the Maldon Crystal Salt Company; it is also the location of the first self-service Tesco supermarket in the country established in 1956. Essex and England cricketer Alastair Cook played for Maldon Cricket Club throughout his early years. Brought up in nearby Wickham Bishops, his brothers played for the club as well. Cook remains closely associated with the club, being an Honorary Life Member, while acting as a huge role model for the club's young players. Cook made his Essex debut in 2003, before making his international debut, aged 21, in 2006. Due to county and country commitments, Cook's most recent appearance for the club came in 2004 when he was rested from the Essex side for the domestic Twenty20 Competition. Private David Embleton won a Victoria Cross, in his army name of Frederick Corbett, in the Arabi Pasha Rebellion in Egypt on 5 August 1882. He was buried in an unmarked grave in London Road Cemetery, Maldon, but in 2004 the regimental association provided a memorial and in 2005 the Essex Society for Family History provided another. He served in the King's Royal Rifle Corps. Although awarded the VC for standing by a wounded officer, he subsequently forfeited his VC after committing theft against another officer in 1884. Unfortunately he died in Maldon Union Workhouse. Edward Bright (1721–1750) was the "fat man of Maldon", a grocer who, at Template:Convert/stone was reputed to be the fattest man in England. His coat could encompass seven men. After his death, etchings of a painting of him were much sought after. His chair resides in the Moot Hall. John Cook (1918–1984) was a prolific 20th century Anglo-American composer, organist and church musician. John Kemp (1926–1987). John Kemp's work on the preservation of Thames sailing barges in the 1960s was critical to re-establishing Maldon as the foremost sailing barge port in the country. John Kemp was responsible for the creation of the East Coast Sail Trust, a schoolship scheme for young people using the sailing barges Thalatta and Sir Alan Herbert, operated from Maldon. He was author of three books and chronicler of the Maldon and Essex coastal scenes and the unique character of the marshland folk, especially in the Maldon and Burnham Standard, Essex Chronicle and Essex County Standard newspapers. John Strutt was born in Langford Grove, Maldon, and won the Nobel Prize for Physics in 1904. ^ "Town population 2011". http://www.neighbourhood.statistics.gov.uk/dissemination/LeadKeyFigures.do?a=7&b=11126253&c=Maldon&d=16&e=62&g=6425400&i=1001x1003x1032x1004&m=0&r=1&s=1442932822723&enc=1. Retrieved 22 September 2015. ^ "Seax Archeaology – Unlocking Essex's Past". http://unlockingessex.essexcc.gov.uk/uep/custom_pages/monument_detail.asp?content_page_id=89&monument_id=24719&content_parents=48. Retrieved 30 November 2013. ^ Eilert Ekwall, Concise Oxford Dictionary of English Place-names, p. 312. 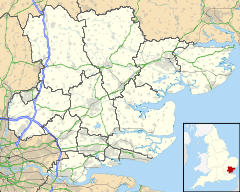 ^ "Anglo-Saxon England's Realm of Essex". http://www.ancientworlds.net/aw/Places/Place/337631. Retrieved 15 February 2014. ^ "Moneyers of the late Anglo-Saxon Coinage". http://etheses.nottingham.ac.uk/1818/1/481170.pdf. Retrieved 15 February 2014. ^ "Maldon – Domesday Book". http://domesdaymap.co.uk/place/TL8507/maldon/. Retrieved 1 December 2013. ^ "Maldon Town Council: History & Heritage". http://maldontowncouncil.gov.uk/history-heritage. Retrieved 18 August 2010. ^ Alexis Brown (10 July 2013). "All Saints' Church, Maldon – Churches – Maldon District Council". Maldon District Council. http://www.maldon.gov.uk/info/200139/explore_the_district/389/churches. Retrieved 1 December 2013. ^ Lindley Keith. "Review: Crowds and Popular Politics in Early Modern England". Institute of Historical Research. http://www.history.ac.uk/reviews/review/618. Retrieved 9 August 2013. ^ "All Saint's Church Maldon". www.itsaboutmaldon.co.uk. http://www.itsaboutmaldon.co.uk/allsaints/. Retrieved 17 July 2012. ^ Fitch, Edward Arthur: Maldon and the River Blackwater. Gowers 1895. ^ "The UK & the Netherlands: Town Twinning". www.britishembassy.gov.uk. http://www.britishembassy.gov.uk/servlet/Front?pagename=OpenMarket/Xcelerate/ShowPage&c=Page&cid=1042219939134. Retrieved 24 January 2007. ^ "Maldon–Cuijk twinning". http://members.lycos.nl/jerom/maldon.htm. Retrieved 24 January 2007. ^ "This is Money – The Story of Tesco". http://www.thisismoney.co.uk/money/news/article-1602957/The-story-of-Tesco.html. Retrieved 31 July 2014. Wikivoyage has a travel guide for Maldon. This page uses content from the English language Wikipedia. The original content was at Maldon, Essex. The list of authors can be seen in the page history. As with this Familypedia wiki, the content of Wikipedia is available under the Creative Commons License.